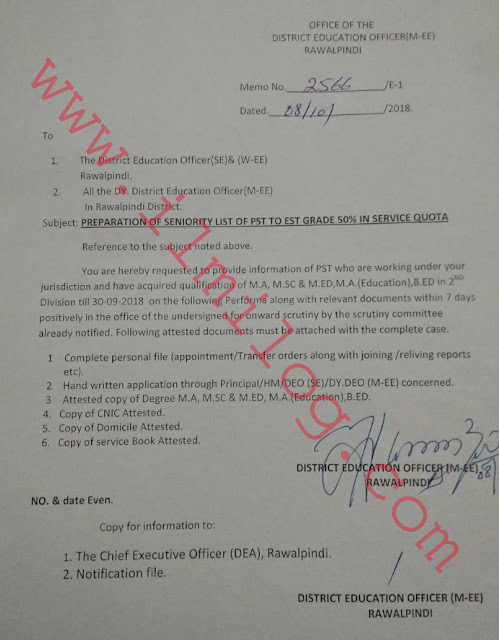 Memo No .2566/E-1 Dated.08-10-2018 has issued by the office of the district education officer (M-EE) Rawalpindi regarding Promotion of Primary school teachers PSTs in Punjab schools education department. 1. The District Education Officer (SE) & (W-EE) Rawalpindi. 2. All the DY. District Education Officer (M-EE) In Rawalpindi District. You are hereby requested to provide information of PST who are working under your jurisdiction and have acquired qualification of M.A, M.SC & M.ED, M.A. (Education), B.ED in Division till 30-09-2018 on the following Performa along with relevant documents within 7 days positively in the office of the undersigned for onward scrutiny by the scrutiny committee already notified. Following attested documents must be attached with the complete case. 1 Complete personal file (appointment/Transfer orders along with joining /reliving reports etc). 2 Handwritten application through Principal/HM/DEO (SE)/DY.DEO (M-EE) concerned. 3 Attested copy of Degree M.A, M.SC & M.ED, M.A. (Education), B.ED. 4. Copy of CNIC Attested. 5. Copy of Domicile Attested. 6. Copy of service Book Attested. 1. The Chief Executive Officer (DEA), Rawalpindi. 2. Notification file.